I frequently talked to my mother in the days and months after she died. Sometimes I still do. I could feel her presence in her favourite armchair and wouldn’t let other people sit there. Even now, I only let the cat sleep on that chair, which remains where it was when she was alive, by the window my mum liked to look out of and watch the world go by. If I close my eyes and try to tune in to the realm of the spirits, I can sometimes hear her voice offering advice or just making a wry comment as she often would in life. Do you think that makes me weird? I used to think so, but after listening to Cal Cooper talk about ghost therapy at Goldsmith’s Anomalistic Psychology Research Unit on Tuesday evening I realised I am far from alone. However, apparently few people readily admit they have been chatting with dead relatives because they are also worried others will think them weird. 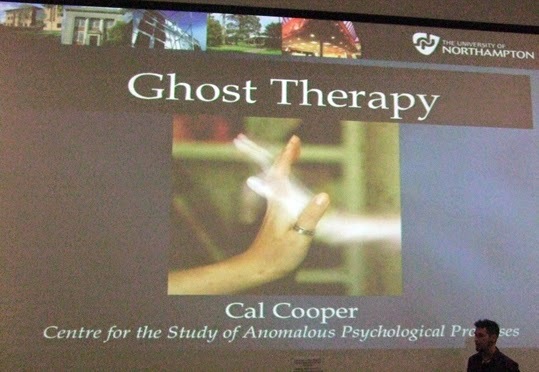 Cal Cooper is doing a PhD at the University of Northampton, lectures on parapsychology and is the author of the book Telephone Calls from the Dead. His talk was about post-death experiences in the bereaved – meaning people seeing, hearing or otherwise sensing a loved one after they had died – and how these experiences can help them get over their grief. A study by WD Rees in 1971 showed it was extremely common for people to sense the presence of a dead spouse or relative – perhaps seeing them and having conversations with them or just feeling they were close or dreaming about them. What’s more, 85% of those people found the experience helpful. Very few were scared – despite ghosts normally being considered pretty scary things. Later research showed that most apparitions of that kind occurred 24 hours before or after the death, with the peak time being at the moment of death. It can happen for months or even years afterwards though. It is a common practice for the window in the room of a dying person to be left open so that the spirit can leave and many nurses have reported seeing a mist passing out of a dead person. Although most of those kinds of experiences are unexpected, other contact with dead loved ones is sought out – such as going to seances. Cal asked whether seances are a bad thing if those going to them feel that they help them. Obviously there is a problem if a medium charges large amounts of money from someone who can ill afford it, but if the seance is free and those who attend feel helped, what is the problem? Most people who go to mediums are generally positive about the experience and it can be considered a form of counselling. It can strengthen a belief in the afterlife and give a sense of peace and comfort. Cal believes that any counsellor who has a bereaved person as a client could help them by listening to any spiritual stories they tell – such as seeing the ghost of a loved one – and “putting themselves in their shoes”. Most of the stories the bereaved relate about connectivity with the dead are helpful. The main positive thing that seems to come from them is a sense of hope – and, like Pandora’s Box, hope is a very important thing to retain when you feel you have lost everything. I thought the topic of ghost therapy and contact with the dead being helpful for the bereaved was particularly relevant at Samhain – or Halloween – when many pagans like to honour dead ancestors and sometimes try to contact them through seances or other rites or ceremonies. As Cal observed, ghosts need not be scary and can give hope at times of darkness.